The summer I traveled with my family to Prague in the Czech Republic, my mother became enamored of the elaborate door knobs, door handles, and door knockers. Her interest sparked a 'treasure hunt' by all of us to find the most interesting and detailed examples. Cathedrals, castles, government buildings, and even the bank each had unique and ornate fixtures. Rather than overlook what seems like such a mundane detail, we delighted in finding and examining each one. One of my favorite door escutcheons (isn't that a great word? ), particularly for the red of the wood and the green behind. As we started to amass a collection, I realized that a photography collage could be a powerful way to display what we had found. That realization made me more intentional in my photographs. I made sure to photograph each element from close up. I knew that I wanted the end results to be squares, rather than standard rectangles, so I took care to leave sufficient space around the edges of the frame to accommodate this later cropping. Another escutcheon, but this one was photographed too close. Cropping to a square cut off the top and bottom, making this one unusable. There are many different programs, downloads, and even apps that can create photo collages. Because I am a bit of a control freak and wanted control over the whole process, I chose to create my collage using Photoshop, but you should choose the method that is most comfortable and easiest for you. My process is explained below. After returning from the trip and downloading all my photographs, I decided to use the consistent tag 'door-handle' for each photograph that I wanted to consider for the collection. (Read more about Why and How to Tag your Photographs here.) So, as I went through and reviewed all my pictures and added relevant tags, I kept an eye out for those door handles and tagged them accordingly. After all the images had been tagged, I simply searched for the tag 'door-handle' and copied those photographs into a separate folder. From there, I used Photoshop to individually view and crop each one to a square format. The exact size (in pixels) of the squares varied between each picture, because I wanted to get the right crop for each image. I knew that my final product would be a 16 x 20 inch poster print and that I wanted a fairly high resolution as well, to keep and showcase the details in the fixtures, so I chose a DPI of 500. This resulted in a final image of 8000 x 10000 pixels (which may have been overdoing it just a bit). After spending some time with various layouts, I decided on a 3 x 4 grid of 12 photographs that would each be 3 inches square or 1500 x 1500 pixels. Then I could go back to each of my squared photographs and re-size them to match. The final step, and the one that took the most time, was narrowing down my top 12 and deciding how to arrange them. In the end, I decided to off-set the most common style of door handle set into an elaborate key plate and space them out nearly every-other square. I also strove for a balance of colors and tones with the fixtures and the doors behind them. Click to view full size. The Doors of Prague is also available for purchase. 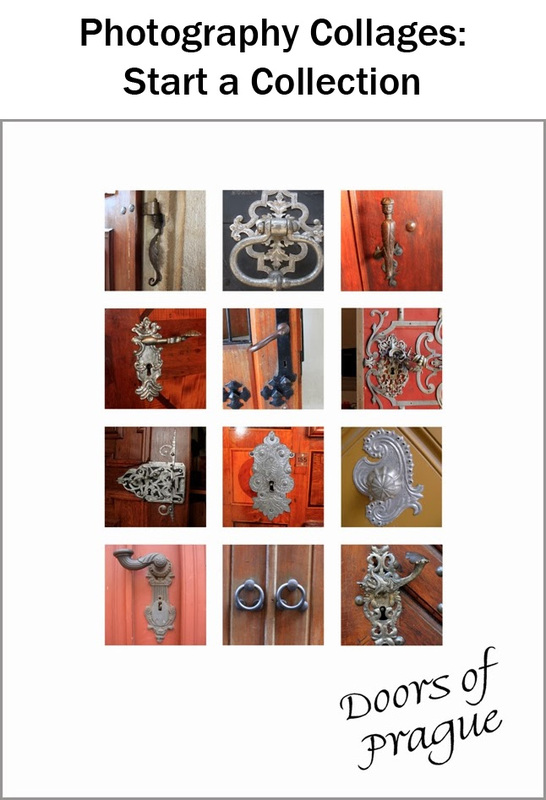 The final product really highlights the similarities and differences between each of the door knobs, handles, and knockers, while also providing a sense of Prague and its history. You can click on the link in the caption to view a zoomable full size version of the poster, which is also available for purchase. Photography collages are popular ways to highlight a specific location, but you do not have to limit yourself geographically. Collages can also be linked by color, theme, or idea. The art teacher recently shared a book about hearts with my third grade students, gave them access to cameras, and sent them off in search of hearts, some of which they found, and some of which they created. Below is an example of those of the final products. You can see the other three posters and read more about them over at her blog, Art is Basic. The school now has framed copies of all four posters, and the students each received their own postcard-sized versions. A great, collaborative project and one that made my students very proud. What could you do with a collage?